Hi everyone!! How are you all? We men tend to get confused when it comes to skin care. I have been using a new face wash these days just to try that out. Previously, I used Garnier men power white double action face wash which was good. 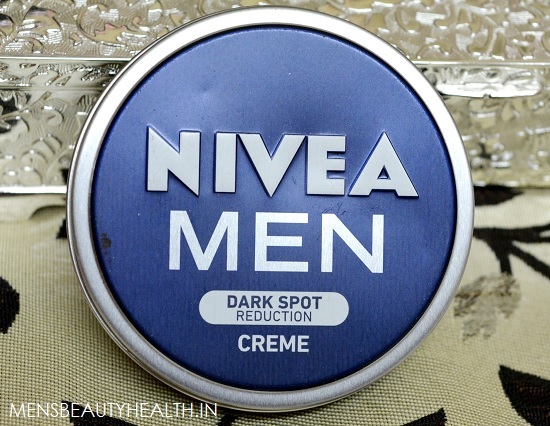 So, now a days, I am using this Nivea for Men Dark Spot Reduction Cream as I was struggling with spots. I was in a search of good men’s face cream for myself. Hence, I got this Nivea for Men Dark Spot Reduction Cream. This cream is for men and is in the cream form while there is a dark spot moisturizer too. I have oily skin and I thought moisturizer would be good but after winters my skin got a little bit dry hence I though using a cream for dark spots. So, let’s get to know how the cream fared for me. By the way, I am liking reviewing the products for men as this can help a lot of guys like me out there to check if a product is suitable or not. 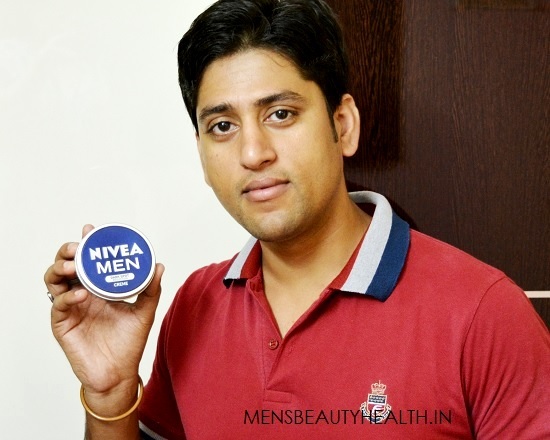 Anyways let’s start the Nivea for men dark spot reduction cream review. 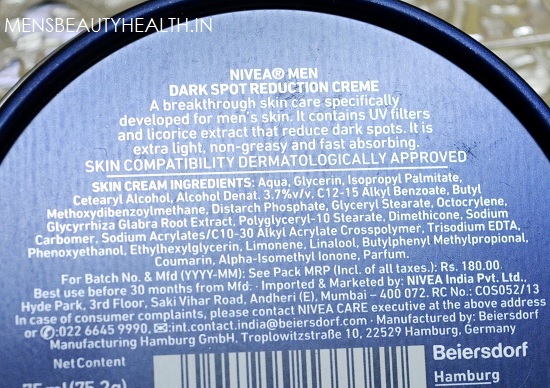 Brand Claims: Nivea for men dark spot reduction cream is a break though and revolutionary product that is designed and formulated for men’s skin. This has licorice extracts which reduces the dark spots and makes the skin fairer. This is not very greasy and is light weight. This absorbs the extra oils and impurities. This cream is packaged in a blue tin tub pack. The pack is nice to look at and has the usual Nivea logo on it. This looks good and I feel the packaging is suitable for men as they can easily carry this in their bags or travel pouch. This Nivea cream has a very faint or subtle smell. That is not too much but can be regarded as bearable. If some of you guys feel that you do not like products that smell a lot then you will be happy to know that this is a mild smelling product. Texture: Nivea dark spot cream has a rich texture. The texture is creamy and light, unlike a lot of creams which can feel extremely greasy and sticky. We men mostly have oily to combination skin and when we ride a bike then the dirt etc gets on the face. So, if men like me who use oily sticky cream, they will feel that their already oily skin is getting oilier. I use this cream 2 times in a day. Once in the morning and second time at night while going to bed. I make sure that I wash my face before using any skin creams as oily skin attracts dirt easily. The dirt and dust that our skin accumulates all through the day can further lead to skin break outs. While I apply this, I only take less than a pea sized amount. This much is sufficient and this cream will spread on the face nicely. For oily to combination skin, this much quantity is okay. The creamy is the product is, the less amount you need. Having said that, if you have dry skin, then you may need little bit more or just try the Nivea for men dark spot reduction moisturizer which I find more hydrating. After the application, I do not feel that the cream is getting heavy on my skin. It feels light and face feels supple. Yes, oils do come on my face after few hours but there is not undesired stickiness. I have been using this Nivea for men dark spot reduction cream for the past 5 weeks. After using this for considerable amount of time, it has made my complexion brighter. Like, I had some sun tanning on my forehead and I noticed that it cream has lightened it. 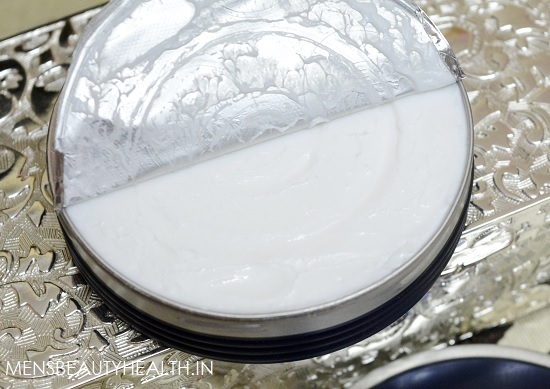 Moreover, there were few dark spots on the cheeks due to acne which this cream has faded. I like that my skin looks a lot even toned and not patchy like earlier. Price of this cream is okay not much but I can understand some college students who have limited pocket money may feel that it is little more, then this cream will last long, since a little bit is required. If you are wondering who can try this cream then let me tell you that this can be tried by all the men who have dark spots or who need a good cream in general. If you have dry skin just apply it and massage. Whereas for oily skin take less amount and it will be okay. But only men with very oily skin should skip this as they can feel that this is getting sticky.